Discover a spiritual practice that helps you maintain spiritual, emotional, physical, and mental health. "We toiled on computers seven days per week, rising as early as 4:00 a.m. to squeeze in spiritual quiet time before we both retreated to our respective laptops, typing the days (and weekends) away. Though I grew up keeping Sundays sacred, six years into our marriage, we'd fallen into the trap of using the Lord's Day to catch up. … At its worst, our church attendance was less than 50 percent. … I began, for the first time in my life, to understand why people don't attend church services." In our culture of constant busyness, most of us feel like we're never caught up. The lines between home and work have blurred as we stay tethered to our mobile devices and computers. Many people use weekends to catch up on errands and other work that doesn't get done during the week. God's commandment to "Remember the Sabbath day and keep it holy" seems like a relic from a simpler time. An ancient spiritual practice exists that can help restore balance to our lives: the practice of keeping sabbath. But how exactly do we manage to build time for sabbath into our busy lives? Dana Trent explores this question in For Sabbath's Sake. With humor and honesty, Trent reveals her own struggles with setting apart a day devoted to God, rest, and community. 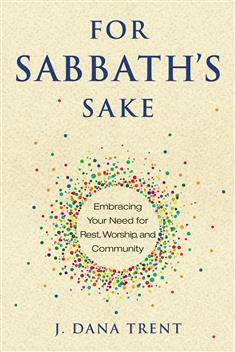 This book traces the rich history of sabbath, helps you find ways to overcome barriers to this spiritual practice, and suggests achievable ways to build sabbath into your life.